- I have updated what I have on my discretionary charts to take advantage of the latest technology to trade the markets in transition. I recently showed the order flow bars - Volume Imbalance Footprint from MarketDelta. I have taken things further using Volume Profile and the new ideas that Pete Steidlmayer is using in recent updates to Market Profile. Pete has moved on to using volume and order flow in a quite complex series of database interrogations that create a number of charts and spreadsheets he uses to trade intraday and short swings. I have taken that and created a single chart and a legacy Market Profile chart that is more visual and intuitive. T Today's pic shows the further development of looking at order flow. I am using MArketDelta for all my discretionary trading as it provides all the information I need in one platform with the best support when I need to chart something new. As you know, I have been using the CCI to see the footprints of order flow for years and years. Now I can see the order flow directly. Win rate is even higher. I am not quite at Pete Steidlmayer's 85% win rate with these new charts but I am confident that with practice I'll achieve that.I made these changes after considerable testing. Leaving a tried and true setup was not easy but when you read the introduction to the book I am writing you will see why. All this has resulted in a much more order flow driven market place. While markets were always driven by order flow, the present markets have no intermediaries that dampen or shock absorb the instant activity which therefore results in more relative volatility. Once we have a mechanism for “seeing” this information we can trade CP. The goal of the ebook is to show how I have created this framework and how I identify the conditions I need to make profitable trades. Here's the MarketDelta chart I now use. It looks a bit busy because of the Volume Imbalance numbers but I only look at that AFTER the trade is on to see how I need to manage it. Pete's mantra is to get the trade on when it fits the plan and then manage it. He's really right as otherwise I get a worse trade location.Trades have a "WHEN" and a "WHERE". This chart plus the Market Profile chart gives me that. The book will show all. This part of the chart had 7 short trades worth 200 euros each per contract. The decision making was pretty objective, There are two modes: the first hour or so and then the rest of the session. theres something i did not get on this stock index future trading via order flow...isnt it that the dax future is reacting to the dax30 index which is generated through 30 stocks (practically due to the weighting through the biggest 10 stocks)...so, wouldnt it be more approbriate to monitor the order flow of those 10 stocks to get on the track of what is really moving this market? Was this before Market Delta? No Peter. Firstly, the futures leads. Secondly its easy to watch one chart rather than 30. The S&P 500 is comrised of 500 stocks. Not possible to watch 500 components to trade the future. 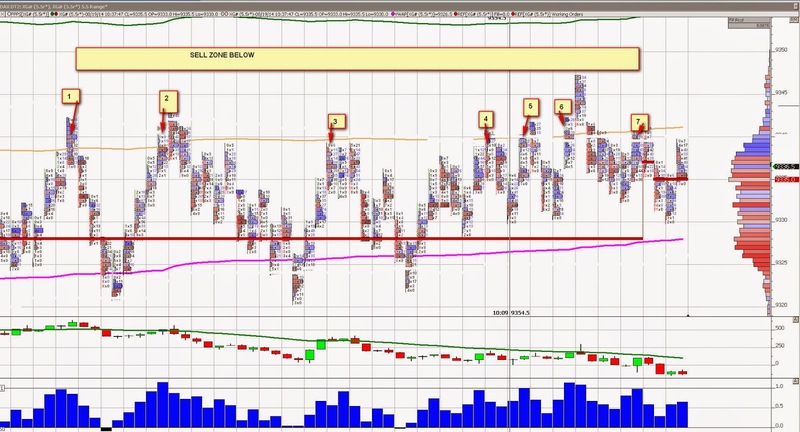 I trade the order flow of the futures. I'll post some Euro and Crude oil futures trades soon. Just trading the order flow. Just one last question: it seems that the CCI is still in use as proxy for the order flow when programming the bots, right? The FloBots are a whole different thing. We need to be able to objectively measure and test in order to have statistics we can rely on for probabilities. Using the CCIs and other indicators is needed to do this. A FloBot may earn 150% a year while a discretionary trader can earn much more than that a month. You mention recent updates from Pete Steidlmayer and also his win rate. Is there a website or blog you follow for this? There are a couple of videos around. Google his name and you'll find them.